“THE NEXT STEP IS DISCIPLINE” proclaimed the legend scrawled into the run-out groove of the self-titled album by The League Of Gentlemen. Released in February 1981, it partially charted the short-lived career of what Fripp liked to call his “new wave instrumental dance band”. However, when it came, the next step took many observers totally by surprise. Yet the ground which the newly revitalised King Crimson now occupied had been liberally hinted at, not least of which by The League Of Gentleman’s one and only album. Containing short, quirky, improbably catchy music layered with sampled conversations (itself an extension of techniques Fripp had utilised on 1979’s Exposure), the record was stamped with the unmistakable musical DNA that had been threaded within Fripp’s compositional approach since the early ‘70s. No matter how disparate their context or setting, a certain unity ran through elements of tracks such as Larks Tongues In Aspic Part 1, Fracture, Talking Heads’ I Zimbra (from 1979s Fear Of Music and on which Fripp guested) and 1980‘s The Zero Of The Signified (from Fripp’s Under Heavy Manners). All bore the hallmarks of fast, cross-picked, cyclical guitar lines which rippled and leapt across the grooves of a rock-solid pulse. Yet despite the littering of such clues, when released in September 1981, the boldness of Discipline’s taut outlines, coupled with the depth of harmonic and rhythmic ideas it employed, seemed light years distant from the textures of Crimson past, wrong-footing some commentators and fans in the process. Whilst there was a reassuring continuity with recent times past in the shape of Fripp and Bill Bruford, the Anglo-American nature of the band with the recruitment of Tony Levin and Adrian Belew, embodied and underlined the heady shock of the new and the desire to embrace change. 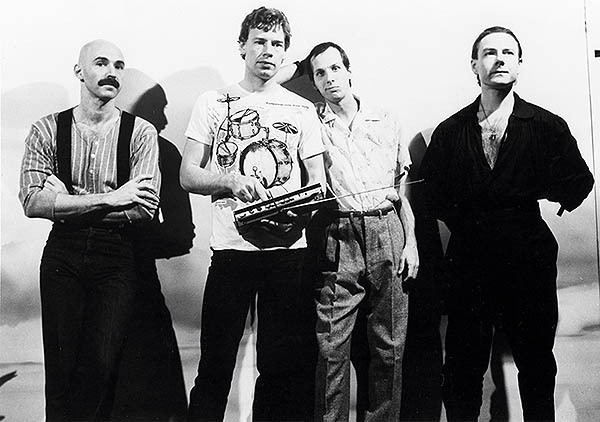 Though Bruford and Fripp had auditioned several hopefuls for the role of bassist (including Bruford’s talented bass player, Jeff Berlin), Tony Levin was always Fripp’s first choice. The auditions had only taken place because the guitarist had assumed that the ever-busy Levin would be unavailable. As Fripp noted in his diary, "Because Tonly Levin is so busy it never occurred to me that he would be interested in a band, otherwise he would have been my first call." As well as finding one of the best front man a group could have, Belew’s instrumental presence enabled Fripp to make the interlocking parts he’d envisaged and had been steadily working towards a reality. Perhaps the most telling example of this is Frame By Frame, whose phase-shifting pointilism draws heavily on Steve Reich’s minimalist aesthetic. Belew’s ear for detail and his astonishing capacity to create elliptical solos of unorthodox and ingenious ferocity, made his contributions to David Bowie, Frank Zappa, and Talking Heads so distinctive. In Crimson he was also given free rein to mine an unorthodox vein of expression in pieces across the galloping meter of Thela Hun Ginjeet, and the acerbic but playful Elephant Talk. Matte Kudasai, who’s instrumental origins dated back to The League Of Gentleman, is perhaps also a nod to the poignant ballads of Crimson past. Topped with Belew’s languid vocal melody, in recent years the tune has begun to enjoy a life beyond Crimson following its inclusion on albums by jazz vocalists. The Sheltering Sky, first played as an improvisation within the walls of an ancient Dorset hunting lodge where the band initially rehearsed is a perfect example of where the sounds of the old world rub up against new technologies to eerie, and sometimes unsettling effect. With the ancient resonance of Bruford’s African slit drum, the soaring, trumpet-like sonority of the Roland guitar synthisiser, and the subterranean growl of Tony Levin’s Chapman Stick, it sits somehow aloof and apart from the period in which it was was recorded. Even today, some 30 years after it was committed to tape, it remains utterly timeless. More than anything, the album is an exhilarating convergence of imaginative and associative leaps of faith, a strange crossroads at which the likes of gamelan, minimalism, bright dynamic rock, inquisitive, experimental sensibilities, and phenomenal musicianship all meet to form something uniquely Crimson. Although the framing concept might have come from Fripp in the beginning, Discipline is anything but the work of one person. The title track and its stylistic counterpoint, Indiscipline, are both a consolidation and a departure. Constructed from several different and independent lines, each one in itself quite fragile. Yet when all the strands are woven together the remarkable results are as strong as they are flexible. Much like the knot-work relief which graced the spartan cover, Discipline, is about the interconnectedness of ideas and experience harnessed together. Remove any one element of those threads and the whole thing will unravel. Whilst some of Crimson’s contemporaries had been content to either rest on their laurels or make a straight forward dash towards commercialism, every sinew of the Discipline-era group and its sound glistened with a dazzling freshness, a supple brilliance that effortlessly surfed the post-punk new wave zeitgeist whilst remaining consist with its core guiding principals. After making their live debut on April 30th 1981 at Moles Club in Bath, under the name of Discipline, an excited Fripp noted in his journal “For me, this is the band I've spent four years getting ready for." Later he would note “...if all this band does is one album, it'll be worth it.” Just 19 days after that live debut and following a short tour, the band assembled in Island’s Basing Street studios to begin recording their first album together. The next time they took to the road in October King Crimson had returned . "It was tortuous going out as Discipline because promoters would immediately halve the money because nobody knew the name," explains Bruford. "I quite liked the name Discipline actually because I'm British and I knew what Robert was getting at with it, but when somebody told me it had changed to Crimson I thought ‘good’ because at least it removed one obstacle to the band's progress."